Explore Our Shiny New Bathroom Showroom! At Kinedo, we specialise in designing and installing specialist solutions that will transform your bathroom. 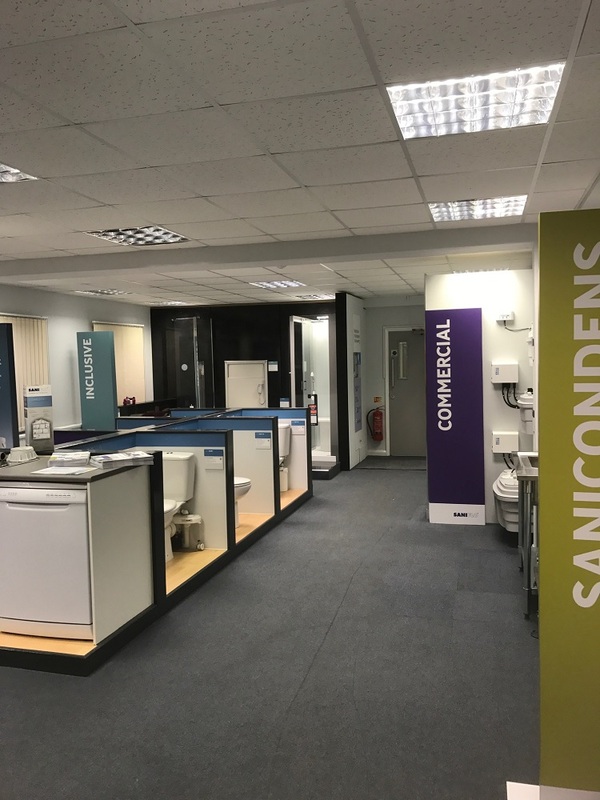 Here’s what happened when we took the time to transform our own space – our bathroom showroom in Bedford. Not bad, but far from perfect. Our new bathroom showroom shows off our full range and our capabilities like never before, and not just our advanced range of shower cubicles. You’ll also find our macerators, our shower trays, the Sanicondens systems for heating and air conditioning, and our selection of inclusive bathroom accessibility products. What’s more, everything’s in its right place, with clearly marked areas and displays to tell you precisely what makes each product special. Let’s take a quick look around, shall we? The new Sanicondens display – our range of condensate pumps for heating and air conditioning. 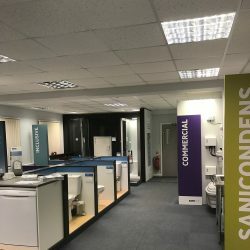 Discreet and easy to install, Sanicondens are specifically designed to dispose of the acidic concentrate from boilers and other water producing equipment, including air conditioning and heating systems, refrigeration units, and dehumidifiers. A brand new section highlighting our Domestic Range. Pictured here is the sublime Horizon Shower Cubicle, plus a few of our advanced home bathroom products – including the super efficient space-saving Sanipack Pro Up. The original and best, here’s the Saniflo UP, our versatile and compact macerator pump that allows you to install an extra bathroom almost anywhere. Also pictured is the Sanitop UP, which can handle both a WC and a wash basin – perfect for small cloakrooms. Our lifting stations are designed to be unobtrusive and easy to install. They’re fitted with quiet motors, so you’ll barely notice they’re there. Here’s our inclusive range of bathroom accessibility products. If you have a bit of trouble getting about, these can help you to retain your independence in the bathroom. And unlike a lot of accessible bathroom products, they look just as sleek and stylish as the rest of our range. Pictured from left to right: The Kineduo Bath Replacement; The Sanimatic electrically-controlled rise and fall WC; and the advanced Kinemagic Serenity. This spacious and stylish walk-in shower is filled with clever and secure accessibility features, including a magnetic handset, comfortable grab rails, an anti-slip shower tray and a folding seat. Here’s our range of twin macerator and pumps. Robust, reliable yet compact and unobtrusive, these versatile systems are capable of processing the waste from multiple appliances in busy business environments and larger domestic situations. Not pictured is the new line of Sanifos lifting stations, which were a big hit at both the Glamping Show and the Farm Business Innovation Show. We work a lot in the holiday and leisure sector, helping landowners adapt their land to suit a range of purposes, like camping and glamping. The Sanifos is the key to this transformation. 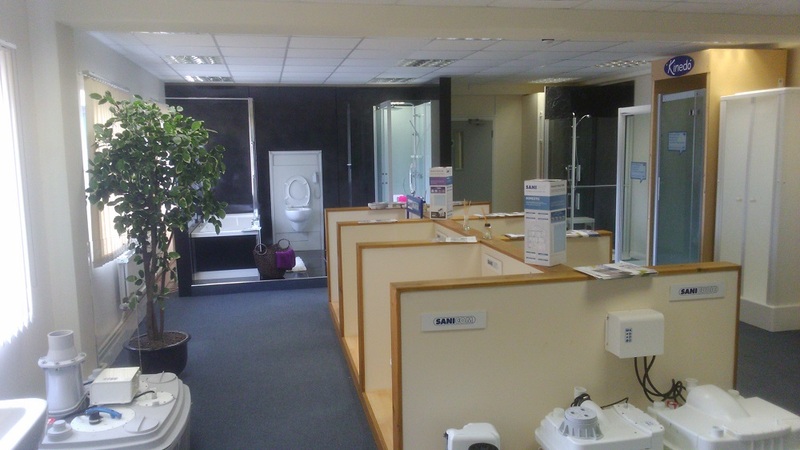 Want to visit our bathroom showroom? To really appreciate just how innovative our range is, you really need to see things up close. Get in touch to arrange a visit to our Bedford showroom. Or use our interactive map to find a showroom close to you.